when is a party not a party? | when you're not invited. To contact an individual, do an internet search on their name and find their official site. Then, look for their contact info (their phone number and email address). It has been asked over and over recently why Trump’s hands seem tied in getting any major issues resolved. Although he has improved the economy for all Americans–beyond historical precedent in some cases–appointed dozens of Constitutionalist judges to lower courts, appointed two Supreme Court judges, enacted prison reform WITH some Democratic support, created thousands of jobs, and has spearheaded numerous other successes, there are still major issues that are deadlocked, issues like those surrounding the Border Wall; the rise of Infanticide and Anti-Semitism; the once-more (remarkably), growing threat of Socialism; the issues of Healthcare, Infrastructure, Troop Withdrawal, countering the growing hegemonic threat of China; and on and on. Why, it is asked, cannot Trump declare a National Emergency on the Southern Border, when in fact, by established law from the Supreme Court, and Constitutionally, he can? There are numerous other examples of why, why, why? Republicans have the Senate, the Executive Office, and a thread of an advantage on the Supreme Court. They have a new Attorney General (who, honestly, hasn’t done squat yet for anyone). All of Robert Mueller’s convictions, by the way, have been for such perjury traps or process crimes, not for collusion with Russia by Trump, and Mueller’s final report, it is expected by many, will only set the stage for Adam Schiff and other House Democrats to attempt to impeach Trump for what? Surprise! A process crime–Obstruction of Justice. Mueller and Schiff’s Democrats had to search for years to settle on just enough of a hint of that to help them make their final move–impeachment. Democrats will surely succeed in their impeachment charges in the House because they have the votes to do so. But, will the Senate finalize the charges? We don’t know. Once again, why? RINO’s. Republicans In Name Only. Never-Trumpers WITHIN the Republican Party. They, singularly and collectively, are thwarting the majority votes needed to block, in the Senate, attacks on Trump’s agenda (the Conservative agenda). Trump doesn’t want to use vetoes. He doesn’t want his every action taken all the way to the Supreme Court for a final decision. He doesn’t want to utilize the “nuclear option.” He doesn’t want to set a precedent for future presidents to ride roughshod over all opposition from every direction–even when legal and Constitutional. And, he certainly doesn’t want impeachment. In the meantime, Democrats are having their pleasure in riding roughshod over all of the Right. “Schadenfreude,” it’s named, to be exact. For agenda progress to occur, these RINO’s need to be “primaried” out in November 2020, or impeached from office before then. That’s where the above CR Scorecard of Top 25 RINO’s, the CR Scorecard of all Congressmen/Congresswomen, and the internet search for the emails and phone numbers of Congressional “leaders” comes in. That’s the bottom line–where the “We the People” comes in. Simply put, for there to be UNITY among Conservatives, the RINO’s have to hit the road, and the “We the People,” unfortunately, have to be the ones to give them the assisting boot. It can’t be Jim Jordan. It can’t be Devin Nunes. It can’t be Tom Fitton of Judicial Watch. It can’t be Andrew Solomon, Kimberly Strassel of The Wall Street Journal, Mollie Hemingway, Sara Carter, Joe diGenova or his attorney wife Victoria Toensing, Victor Davis Hanson of the Hoover Institute, and it can’t be Mark Levin. It can’t be any of those Conservative warriors or any of the many others, by themselves or in concert. It all comes down to the “We the People” as a unified force. Congressmen and Congresswomen are there to represent US, their constituents. We are not here to suffer THEIR boots in our butts. Constitutionally, it has always been constructed the other way around. They lead by our directives. Share or copy-and-paste this entire “Call to Conservatives” with ALL of your friends. Ask that the recipients in turn share with ALL and ask that their recipients in turn share with ALL . . . Down the line, nationwide. Use blogsites, Facebook, Instagram, the URL for this shout-out on Twitter. Get mad as hell! Set aside fear. Demand that your Representatives’ disunity is NOT acceptable, especially at this critical time. They are the Representatives of We the People. Saturate America with this news! Then, unfortunately, ALL have to take it upon themselves singularly to flood BOTH the email boxes and phone lines of Senators and Representatives, putting them on immediate notice, not just once, but as often as able and for as long as able until November 2020. Manifest the needed force of unity with the collective power of individual minds and fingers. UNITY among ALL Conservatives is now paramount, and love for America HAS to take precedence over hatred of Trump. Otherwise? Meghan McCain’s eulogy for her father, certainly revered from above by her anti-Trump father, was powerful, memorable, and one of the most ever heart-wrenching tributes to a girl’s father. The gathering was an equally full honors-to-McCain majority of the most powerful statesmen and stateswomen in American politics within the last fifty years–and easily one of the most populated with never-Trumpers. Perhaps a wry counter-poke at the packed crowds of faithful and fervent “parishioners” who regularly flock to the now frequent Trump rallies. The service was full of recognition for the real-life valor that John McCain had earned, along with a disheartening peppering of beyond-the-grave and frankly hateful jabs, animated by what he had become in the last years of his life. I will try to remember him for what he was. For the bitterly hateful and disrespectful-of-the-office-of-the-presidency legacy that he unashamedly, even proudly, left behind at the end of his long trail, I would likewise shout the same to his face. However tragic he became, though, I sincerely pray for his eternal rest in the Lord! “What a steaming pile of VOX.com, B.S. propaganda! All any reasonable person has to do is question the [mal]intent of VOX vs. the intent of ICE. President Trump has turned the Salvadoran-American street gang into public enemy No. 1. MS-13 has become the face of the Trump administration’s favorite trope: the idea that people from other countries are sneaking into America and importing violence and crime. Talking about the gang has allowed Trump to associate crime with immigration without having to deal with the inconvenient truth that immigrant crime rates are, if anything, lower than those of the native-born. But Democrats (and some local law enforcement officials) argue that the Trump administration is nonetheless using MS-13 to demonize all immigrants — that immigrants themselves are the biggest victims of MS-13, and that harsher immigration enforcement impedes the kind of community policing that allows police officers to distinguish innocent immigrants from gang members. 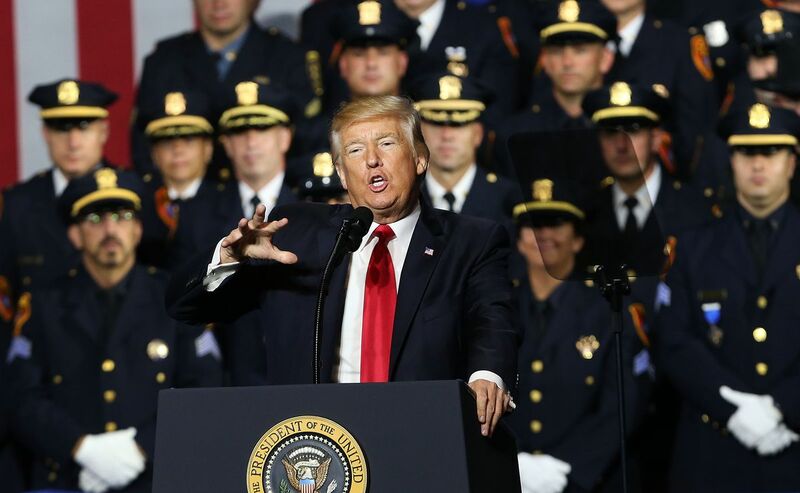 “We’re going to destroy the vile criminal cartels MS-13 and many other gangs,” said President Trump during his speech on July 28, 2017, in Brentwood, New York. It’s easy to see why MS-13 has become Trump’s perfect antagonist. The group, born on the streets of Los Angeles, has established a foothold in the suburbs of New York City, Boston, and Washington and has announced its presence with brutal and horrific murders. MS-13’s “foreignness,” its official status as a transnational criminal organization, and its penchant for ultraviolence — the machete is a frequent weapon of choice — certainly make for sensationalistic copy. But the attention that MS-13 has received is disproportionate to its impact. MS-13 hasn’t reversed nationwide trends of declining violent crime, even in the areas where they’re most powerful. And for all the horror it inspires, the gang has never numbered more than 10,000 members in the US. MS-13 has been responsible for gruesome crimes, but the fact is that it is not a major criminal presence at the national level. The reason it has suddenly become part of the national discourse on immigration policy is that President Trump has put it there, front and center. In a way, Trump got lucky that the current wave of MS-13 violence coincided with his rise to the presidency, providing him with a convenient foil. And if he gets his way, the policies he wants to implement to clamp down on the gang will only make things worse and do further harm to the immigrant communities around the country who are already most victimized by the gang. MS-13 was born in the USA. It started as a youth gang of Salvadoran teens in Los Angeles: “more of a social than criminal group that gathered around a shared taste for rock music and marijuana,” according to the journalist Hector Silva Avalos. The LAPD’s first reference to the “Mara Salvatrucha Stoners” dates to 1975, but most analysts peg the group’s growth into something significant to the early 1980s, when Salvadorans began to flee a brutal civil war in their home country and come to the US as unauthorized immigrants. They faced hostility from other ethnic groups for being new, and from other young people for being long-haired mosher types, so they banded together and called themselves the Stoners — later Mara Salvatrucha, and eventually, once the gang had metastasized under the network of Southern California Latino gangs known as Sureños, MS-13. When and why the “Stoners” became a hardened violent gang is up for debate. Avalos attributes it to repeated confrontations with other LA gangs, while journalist Ioan Grillo thinks it has more to do with the arrival of newer Salvadoran immigrants who were “hardened by the horrors” of civil war. Salvadoran journalists Carlos Martinez and Jose Luis Sanz, meanwhile, say that the gang’s story paralleled that of a lot of young men during the “tough on crime” era: They were minor delinquents stuffed into jails and prisons, where they had the time, opportunity, and incentive to become hardened criminals. No matter where MS-13 first adopted its current nihilistic ethos — which marries semi-Satanic imagery (the original Stoners were Judas Priest fans) with extravagant brutality and violence — mass incarceration and deportation were what took the gang international. 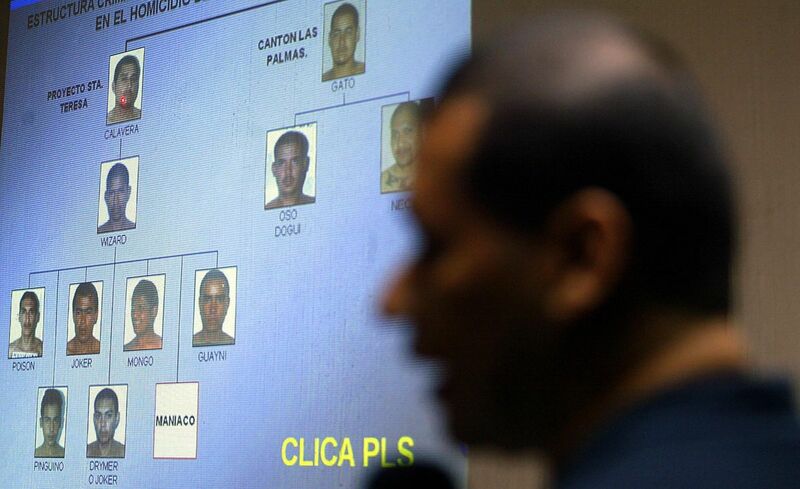 El Salvador’s National Civilian Police reviewing Mara Salvatrucha gang leaders in 2004. At the same time, with the civil war finally over, the US made a renewed effort to deport unauthorized immigrants back to El Salvador. And in 1996, the Illegal Immigration Reform and Immigrant Responsibility Act led the government to start deporting large numbers of immigrants who’d been convicted of crimes (including legal immigrants stripped of their legal status due to their criminal records). By the turn of the 21st century, gang members were an American export. According to one estimate, 20,000 criminals were sent to El Salvador from 2000 to 2004 — a considerable number for a Salvadoran government that didn’t have the capacity to deal with criminal organizations and that wasn’t being notified which of the deportees being returned to them were criminals, thanks to US law at the time. To be sure, most MS-13 gang members in El Salvador were not deportees — according to one 1996 survey, only 16 percent of Salvadoran gang members had been to the US, and 88 percent of them had joined the gang in El Salvador — but between the deportation of gang leaders and the cultural appeal of “thug life,” the gang itself was absolutely an import from the US. As the US’s gang problem became El Salvador’s, the Salvadoran government responded in the same way the US had — with mass incarceration of young men — only worse. El Salvador imported a zero-tolerance “mano dura” (firm hand) policy from Honduras, leading to the imprisonment of 31,000 young people from 2003 to 2005 simply on the suspicion that they were members of gangs. Eighty-four percent of them would ultimately be released because the government didn’t have evidence to charge them with anything. In the meantime, incarcerated members of the same gang were kept together in dedicated prisons — which reduced violent confrontations in prison but also made it a lot easier for gang leaders to consolidate and plan criminal activity. 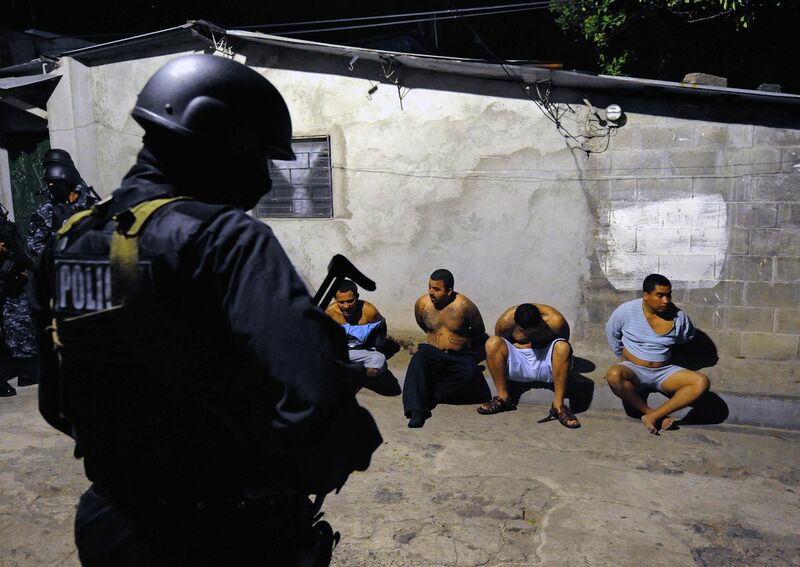 National Civil Police officers completing a raid of suspected MS-13 members in San Rafael, Santa Tecla, El Salvador, in 2008. The US may have exported MS-13 to El Salvador, but, according to most experts, it was Salvadoran MS-13 members who eventually founded cliques on the East Coast of the US (though some think MS-13 spread to the East Coast from California). Those cliques, in the suburbs of DC and Boston and on Long Island, started garnering attention for themselves in the mid-2000s with their gruesome executions. But the George W. Bush and Obama administrations and local governments struck back, with aggressive investigation and prosecution of MS-13 clique leaders and multi-pronged local policing strategies to starve gangs of new members. The response may or may not have reduced the total number of MS-13 members in the US — official estimates have ping-ponged between 6,000 and 10,000 for years (with current estimates at the high end of that range) — but it appeared to put an end to the grisly violence that had drawn public attention. Law enforcement “effectively decimated” the DC-area MS-13, as the Washington Post wrote in 2017, and rendered the Boston-area cliques dormant for years. It worked — until it didn’t. MS-13 is officially a “transnational criminal organization.” But really, it’s short on the “organization” part. The US Department of the Treasury officially designated MS-13 as a “transnational criminal organization” for the purpose of economic sanctions in 2012. It was the fifth organization to be designated that way, joining some heavy hitters: the Russia-based Brothers’ Circle, the Italian Camorra, the Mexican cartel the Zetas, and the Yakuza in Japan. But most analysts agree that MS-13 doesn’t really belong in that company. 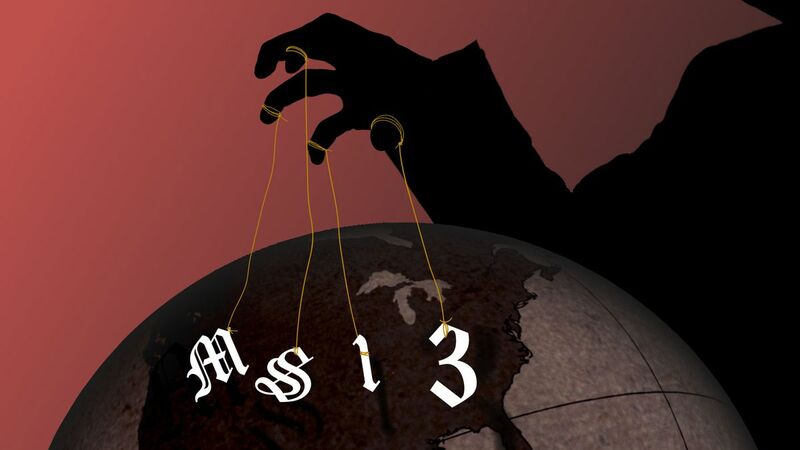 Those other organizations are sophisticated global syndicates with several different illegal revenue streams crossing borders; MS-13 is more of an internationally franchised street gang. A 2016 Congressional Research Service report argued that “the term transnational criminal organization, or TCO, might be misleading when used to describe” Central America’s maras; the 2017 National Drug Threat Assessment from the Drug Enforcement Agency (DEA) categorized MS-13 as a “national gang” rather than a TCO. There are two substantive differences between MS-13 and more sophisticated criminal organizations. The first is organizational: MS-13 cliques in different areas are less like branches of the same organization than like franchises. The West Coast and East Coast MS-13 don’t have a ton of common ground or mutual trust. Efforts to unify cliques into a “national program” have fallen apart before. Different cliques are definitely in communication, and members sometimes flee to another clique in another city after committing a crime to evade law enforcement, but that’s just street-gang-level stuff on a bigger geographic scale. The second is economic: MS-13 makes its money through relatively small-time drug dealing and old-fashioned extortion. That extortion can be brutal, and sometimes wide-scale: In 2015, they extorted the bus drivers of San Salvador into going on strike for higher wages, so that more of those wages could be turned over to the gang. But it’s not as sophisticated as the multitude of revenue streams that other transnational criminal organizations have. Nonetheless, MS-13 occupies a lot of real estate in the imagination of many Americans — and politicians. What really distinguishes MS-13 is the spectacle of its executions. As anthropologist Jorja Leap told the Atlantic, “They don’t just kill people, they cut off body parts.” In 2003, MS-13 members in Northern Virginia retaliated against 17-year-old Brenda Paz for informing on the gang to the FBI by stabbing the pregnant Paz so violently in the neck that “her head was almost completely severed” when her body was dredged out of the Shenandoah River. In spring 2017, as many as 10 gang members in Wheaton, Maryland, stabbed a victim 100 times and cut out his heart and buried it separately. 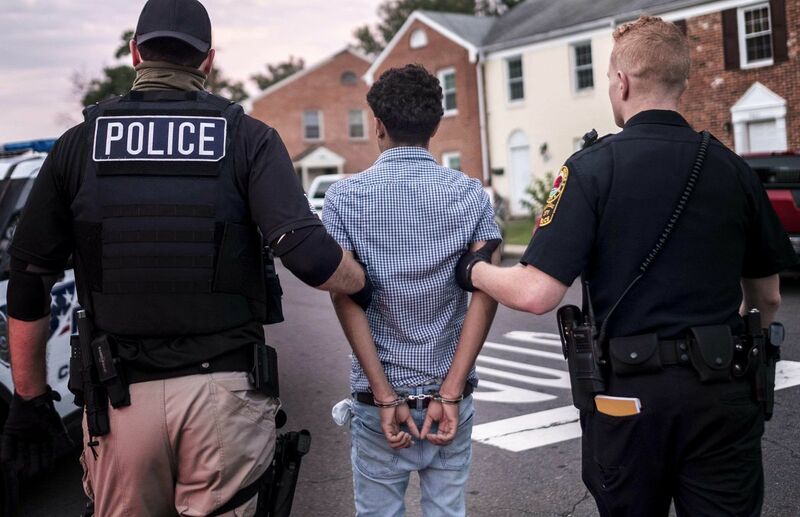 ICE and gang task force officers arrest alleged MS-13 member in Manassas, Virginia, on August 10, 2017. In the communities where MS-13 has been highlighted — Suffolk and Nassau counties on Long Island; Montgomery County, Maryland; Fairfax County, Virginia — the gang’s activity makes up a large percentage of murders and violent crime. Suffolk County had only 22 homicides in 2017 but attributed 14 of them to MS-13. That said, murder is declining even in the counties most bedeviled by MS-13. So why has the gang become so notorious? That list of communities above offers a clue: MS-13 has established itself in major metro areas — New York and DC — whose local media outlets have national reach. (MS-13 is also active in North Carolina, and some of the most gruesome murders of this wave happened in Houston, but those aren’t the cases that have drawn national attention.) And the gang is strongest in the suburbs of those metros. The “you” in this case isn’t actually the community that’s being targeted — which is, overwhelmingly, fellow Salvadoran immigrants. It’s white voters who feel just close enough to violence to feel abstractly threatened. It’s an updated, hyper-localized version of the political dynamic of crime in the 1970s and ’80s, when criminal justice policy was designed to appeal to white voters in the suburbs, but its effects were largely felt by nonwhite Americans in inner cities. In the early 2010s, the pendulum swung to indifference. Intensive anti-gang programs in the Virginia suburbs were cut 85 percent, a casualty of Congress’s elimination of earmarks. In the middle of the decade, it swung to rage. In spring and summer 2014, America was transfixed by a “crisis” at the border: Border Patrol officials were being overwhelmed by people coming from Honduras, Guatemala, and El Salvador, often children unaccompanied by a parent. Increasing numbers of unaccompanied children had been coming to the US from the “Northern Triangle” since 2011 — and after the gang truce in El Salvador fell apart in 2013, giving way to a wave of violence that made the country the most violent in the world for a few years, the pace of children fleeing to the US accelerated. While the influx slowed in August 2014, tens of thousands of unaccompanied children continued to enter the country through 2016. In all, about 260,000 unaccompanied children migrated to the US from 2012 to June 2017. Many of them claimed to be fleeing from imminent danger posed by local gangs, among them MS-13. While their ultimate immigration cases — often for asylum or a special immigrant status for juveniles — were pending, they were able to enter the United States. The surge received wide coverage in the media — and activated latent anxieties among Americans. In June 2014, only 3 percent of Americans told Gallup that immigration was the most important issue facing America; in July 2014, it spiked to 17 percent, the highest level in a decade. The idea that so many migrants were being received at the border and then released into the US seemed to many Americans like a security crisis — even a slow-motion invasion. The fact that the asylum seekers were fleeing gangs didn’t seem like a point in their favor, particularly among Americans who believe America is weakened when people from “shithole countries” are allowed to resettle here. But there was no large-scale infiltration of the US by MS-13 members. In June 2017, interim Chief of Customs and Border Protection Carla Provost told the Senate Judiciary Committee that 159 unaccompanied minors who had been processed by Border Patrol between September 2011 and June 2017 were “confirmed or suspected” to have gang ties — a “very low” number, as she said, given that about 260,000 unaccompanied children were processed during that time. 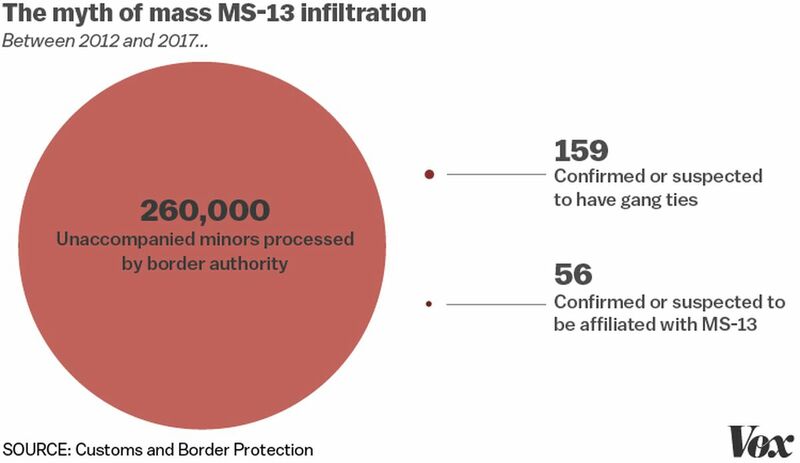 Of those 159, 56 were “confirmed or suspected” to be affiliated with MS-13. By CBP’s estimates, 0.02 percent of the unaccompanied minors who came to the US — one in every 5,000 migrants — had some MS-13 affiliation. That might be an undercount — or, conversely, it could count migrants who were wrongly suspected of being MS-13-affiliated because a Border Patrol agent misunderstood their tattoos, or because they had relatives who were in MS-13 but weren’t themselves, or who had been coerced into joining the gang and had fled to the US to escape its clutches. But with MS-13, perception has been more powerful than reality. More than anything President Obama did, the 2014 border crisis activated the immigration anxiety Donald Trump would ride to the Republican presidential nomination in 2016. As a candidate, Trump didn’t talk much about MS-13 in particular. He was usually happy to talk generally about how dangerous immigrants — or, at his most specific, unauthorized immigrants — were. After the election, however, he appears to have been alerted to the MS-13 threat — and since then, both he and Attorney General Sessions have turned the gang into their rhetorical public enemy No. 1. MS-13 is a perfect foil for Trump. It allows him to connect the reality that gangs have taken over much of El Salvador with the fear that parts of America have become similarly lawless and unfamiliar — abetted by foolish local “sanctuary city” governments. Furthermore, it allows him to do that without saying anything that sounds like an obvious racist dog whistle. When Trump said Mexico was “sending” rapists and murderers over the border, people across the political spectrum recognized that he was playing on racist fears. But the same criticism doesn’t resonate as much when Trump talks about an actual criminal gang. The real tragedy of the unaccompanied migrant wave was that for all the concern about whether the US was doing enough to deter and screen child migrants, not many in Washington paid much attention to what happened to them once they entered the US. And under the fog of indifference, some of the teens who had left gang-ravaged El Salvador for the US ended up caught in the life they were trying to escape. 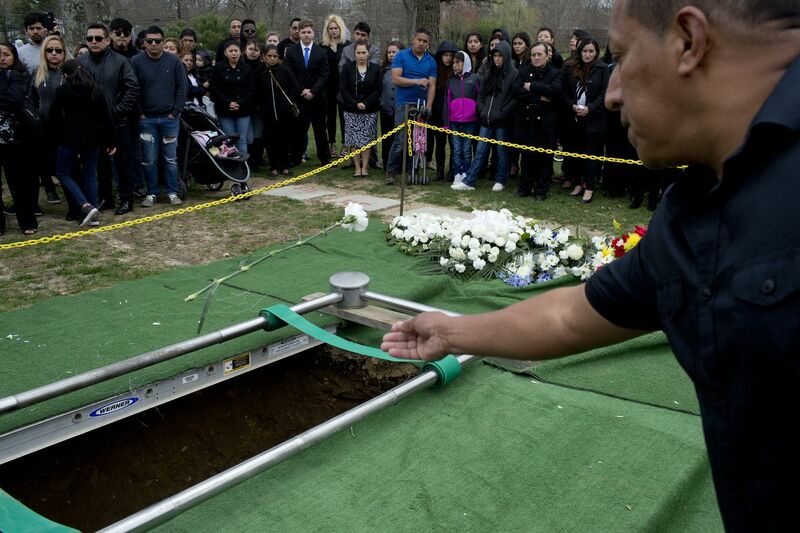 In 2017, the Washington Post told the story of Maria Reyes, who had paid $11,000 to bring her daughter Damaris to Maryland from El Salvador in 2014, only to lose her at 15 when she was killed by a group of teenagers in MS-13 (two of whom had also come to the US as unaccompanied minors). Other parents of migrant teenagers who were killed in gang violence voice the same disbelief and disillusionment: that gang members weren’t supposed to be in America. But the history of MS-13 shows that where gang members are matters less than the strength of the institutions that are supposed to protect the public from them. 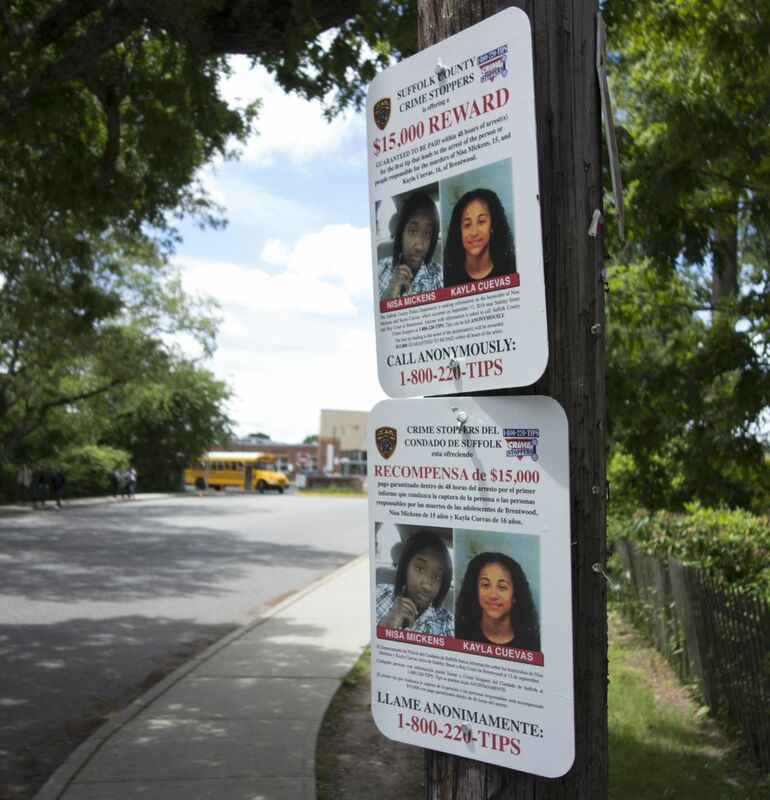 Reward posters hang near a Brentwood, New York, high school asking for information on the homicides of two teenagers on September 13, 2016. Those institutions were weak or nonexistent in El Salvador. They were supposed to be strong in America. But this is the problem Stuntz identified: Both indifference and rage toward marginalized communities weaken the institutions that are supposed to protect them from crime. Many teenage migrants settled with relatives in communities that already had large numbers of Guatemalan, Honduran, or Salvadoran immigrants. Those communities, where public schools and services are often underfunded already, now got tens of thousands of newteenagers — many of them with traumatic pasts, few of them with close relationships with the relatives (even parents) with whom they were living, nearly none of them English speakers. The Department of Health and Human Services didn’t have the ability to work with schools or local governments to make sure migrants were getting the legal and social assistance they needed once they were in their new communities. They didn’t even have the ability to screen would-be guardians rigorously — at least a few unaccompanied minors were released to people who weren’t related to them at all and turned out to be human traffickers. “The resulting isolation that many of them feel or experience makes them more susceptible to victimization, gang recruitment, and participation in criminal activity,” a Montgomery County internal report from 2016 read. School authorities weren’t always willing or able to help. Some misidentified gang intimidation as bullying; some were simply scared of the gangs. And when law enforcement came through and did gang sweeps, they weren’t able to distinguish gang members from people who were trying to live their lives gang-free. Trump’s policies won’t destroy MS-13. They will, if anything, only make things worse. Local officials don’t always agree on the extent of the MS-13 threat. Prosecutors tend to talk up the threat; police officers downplay it. This makes sense — police officers have no interest in making it seem like they’re failing to do their jobs, while prosecutors want to emphasize how important it is to lock people up — but it also demonstrates just how much the discussion of MS-13 is shaped by political incentives. When something dramatic happens, politically, we speak of it in the most larger-than-life terms because that’s going to get the governor’s attention; it got the president’s attention and the attorney general’s attention […] It got us resources, and we’re using that money. Part of the negative side of that is things like this might get overblown. Local police and social workers emphasize that no anti-gang approach can be solely carceral; that education, mental health care and social intervention are just as important to present teenagers with appealing alternatives to gang membership. And in the one place in the US where MS-13 was once strong but hasn’t been engaging in spectacular violence in the current wave — Los Angeles — that’s what they’ve done. But that’s not what East Coast communities have money for right now — or what they’re getting. The “resources” the Suffolk County executive mentioned to the Times took the form of a $500,000 grant from the Department of Justice, most of which was to be used for enforcement — with “a small amount,” the Times wrote, for education. The more pressing policy question for local authorities dealing with MS-13 is the Trump administration’s immigration crackdown — and what that means for law enforcement efforts in the immigrant communities where MS-13 is entrenched. When law enforcement’s biggest problem is proactively identifying who gang members are, and distinguishing them from their victims, the solution has to involve talking to community members more. And between the Trump administration’s use of federal immigration agents to sow fear in immigrant communities and its attempts to pressure local law enforcement to help federal agents take immigrants into custody, immigrants have every reason, right now, not to speak to a police officer. Liquorie and his fellow law enforcement officials are careful not to directly criticize President Trump or his agenda. But it’s apparent that the demands Trump is making on behalf of communities threatened by MS-13 are exactly the things that community leaders worry about. Trump has cast MS-13 as cartoon villains in a fantasy armageddon. But the gang is not a metaphor. And the immigrant communities that MS-13 preys on are very much real — and they’re the ones in harm’s way. Trump’s actions to date show that he doesn’t see it that way — that is, if he sees those communities at all. Family and friends at the burial service of Justin Llivicura, a 16-year-old high school student in Long Island, New York on April 19, 2017. He was murdered in a local park in what many suspect to be an attack from MS-13 members. The Left is abusing American high school education in its struggle to gain and retain political power. We only found out about this incident by accident. How many more? Shortly after President Trump’s inauguration, a group of public school history teachers in the posh Boston suburb of Newton pledged to reject the “call for objectivity” in the classroom, bully conservative students for their beliefs, and serve as “liberal propagandist[s]” for the cause of social justice. This informal pact was made in an exchange of emails among history teachers at Newton North High School, part of a very rich but academically mediocre public school district with an annual budget of $200 million, a median home price of almost half a million, and a median household income of more than $120,000. Read the entire email exchange here. I obtained the emails under a Massachusetts public records law after one of those teachers arranged, earlier this year, for an anti-Semitic and anti-Israel organization to show Palestinian propaganda films at Newton North. This stunt earned the Newton Public Schools district a rebuke from the New England branch of the Anti-Defamation League and from Boston’s Jewish Community Relations Council. But, as the teachers’ emails reveal, Jew-hatred is not the only specter haunting the history department at Newton North. Ibokette was responding to an email from another Newton North history teacher, David Bedar. Bedar was same teacher who hosted the anti-Semites at Newton North, and has played a significant role in the years-long controversy over anti-Jewish bias in the public schools of the heavily Jewish suburb. Personally, I’m finding it really difficult in the current climate to teach kids to appreciate other perspectives. . . [T]he ‘other viewpoint’ might not really be an argument ‘about which reasonable people can disagree’ and might not lead to any kind of intellectual, policy debate; it might just be blatantly racist. . . . [I]t feels wrong to not call out ideas that I know will offend many of my students and create a hostile and potentially unsafe environment. . . . I’m worried that as a school we’re so focused on making all kids feel safe and being PC that we’re not showing enough concern for [immigrant] students whose very rights to attend this school and receive an education are being seriously threatened. . . . I don’t feel good about protecting [a nativist] student’s right to a so‐called ‘political’ view. . . Do I really have to avoid saying ‘I think nativism is bad? [‘] The eugenics movement was based in large part on immigrants destroying our country. Bedar’s strawman argument is fallacious. Trump administration immigration policies and the Americans who support them have nothing to do with eugenics. To claim without evidence and by tenuous association that they do is repugnant. Much worse yet is Bedar’s display of extreme political intolerance toward the views of millions of his fellow Americans, among whom are, presumably, a number of his own students. Support for immigration law enforcement is by no means a fringe political perspective, even in Massachusetts. It is certainly not some sort of taboo that must be expunged from classroom debate, and Newton North guidelines explicitly tell teachers to teach about the reasoning behind different perspectives on immigration. Yet, in remarkable language, Bedar demanded that the school allow him to propagandize against it, and to do so without any professional consequences: “I have an obligation to teach civic duty and teach kids right and wrong, and about social justice. . . . This will probably be an unpopular opinion, but I don’t actually think we should have the option of not discussing [social justice] issues. I feel responsible for doing so. . . . We can help kids interpret the lessons of the past better than anybody. I feel like a phony when I’m not doing that. . . . But..this is hard. I don’t want to get fired for being a liberal propagandist” (emphasis added). Bedar is, of course, wrong on multiple levels. A master’s degree in teaching is risibly inadequate to qualify anyone as the arbiter of right and wrong, and a history teacher’s basic obligation is to teach history accurately and objectively. A sine qua non of that obligation is to avoid propaganda of any kind. In that kind of lurid light, where no shades of gray can possibly exist, people who lack the “right” politics must pose, in Ibokette’s words, a “real, immediate, and present danger” to human progress, and to all that is right and good. Men who light up the world in such stark contrast fill history books with their crimes. The year after the Soviet Union fell, I entered fifth grade at State School No. 8 in the Siberian city of Tomsk, where I was born at the beginning of the end of that evil empire. Usually, Soviet children started learning the history of Russia in fifth grade, but my teacher told the class that she had nothing to teach us anymore. “The old history books are useless now,” I distinctly remember her telling us. “They were full of Communist Party lies.” Just like that, the entire monument of official Soviet history, built upon an ideological foundation of lies and held together by despotism, crashed as soon as the coercive power that had kept it upright for 74 years disappeared in an instant. Left-wing activists are dug in at all stages of the American educational process from preschool to graduate school. Undaunted by the failures of their comrades in the Soviet Union and other socialist hell-holes, left-wing activists are dug in at all stages of the American educational process from preschool to graduate school, where they seek to replicate the Soviet Union’s abuse of its children’s minds with lurid lies. Even science education is facing a hostile takeover by progressive luddites with scientific degrees who insist, as one biology PhD student did recently, that “to think there are universal truths perpetuates a particular kind of able bodied white cisgender male logic.” The result of all this left-wing obscurantism is a brainwashed Generation Z that inhabits a false reality colored in stylized black and white by leftist dogma—the same false reality that Soviet school and preschool battered into me as a child. The Left is abusing American high school education in its struggle—not to do good, but to gain and retain political power. The ongoing trend of growing political intolerance and ideological bigotry among the newest American adults will continue, and nothing good will come of it. In the Soviet Union, I’ve seen what young people could be turned into, what I myself could be turned into. Trust me, America hasn’t seen anything yet. Ilya Feoktistov is a member of the board of directors of Americans for Peace and Tolerance. Often now, when I go to put the hummingbird feeders out with the sunrise, a single hummingbird flies up close to me while I’m still holding the two feeders. It then drinks from the feeders while I’m still holding them in my hands. This morning, two hummingbirds came up to me and drank from the feeders while they were still in my hands. In this goofy world, there are still moments that are so heartwarming and magical to me! Parkland, Florida Mass Shooting: The Tipping Point? February 15, 2017: This is a Facebook post of mine from the day following the Sutherland Springs, Texas church shooting. I am currently writing a post on my current thoughts of what CAN be done realistically, effectively and in a non-partisan or political manner. I will share that soon. Everyone has their own view of a solution, usually staunchly partisan, but NOW, more than ever, is the time to make public each of our REALISTIC solutions. I believe and pray that yesterday’s Parkland, Florida mass shooting IS the tipping point. It has to be, with the full participation of all American citizens’ voices, regardless of cultural or political differences. Let’s all come together. These senseless tragedies CAN be stopped as close to 100% as is humanly possible. We must actively advance civility. November 6, 2017: Here’s my take on the frightening and unacceptable rise in gun-related murders in America. Banning guns is not a real solution. Why? There are already half-a-billion guns out there. That is what I believe is the current estimate. What are authorities going to do? Will they go house-to-house confiscating those guns? I think not. Banning guns will not solve the problem of all the guns that are already out there that cannot be thoroughly confiscated. Automatic or semi-automatic weapons, maybe, which I would completely support, but even those, present owners would not give them up easily. As far as improving background checks, the presently deceased gunman in the Texas shooting was dishonorably discharged and court-marshaled from the Air Force. His right to own a gun was taken away, yet he found a way to buy a weapon—four years in a row! He must have lied on his forms or found some other weasely way to purchase his four guns. A more thorough background check migh make it harder for people to buy guns, but I believe that where there is a will, there is a way. There are too many guns out there already that can be bought or stolen. As far as mental health, the killer in the Texas mass killing reportedly sent threatening text messages to his mother-in-law—who attended the Baptist Church where the shooting took place, although, she wasn’t there at the time of the shooting. Why didn’t she report those texts to the authorities? Would the authorities have responded? Is it a current crime to send threatening texts? Maybe strengthening background checks would help. Would all gun-sellers take those strengthened checks seriously? As far as those who seek mental health assistance; counselors, therapists and psychiatrists are bound to keep their records sealed to protect privacy. Perhaps a legal warrant for those records would supply those records in the case of someone who appears to them to be a threat to others, or especially capable of a mass shooting, but even so, would that violate privacy rights and also result in dissuading many others, who are ill, from seeking out help that might prevent them from hurting others? I think so. Lastly, what of family members, friends or others that have more defined “red-lights” as to their strange behavior, or stained backgrounds? Constitutional rights are not that easy to be taken away in an exceptional and valuable, FREE country. It’s not easy to declare a family member insane, for example, because there are laws that protect that person from being taken advantage of by family members that want to lock them away to take their inheritance or for some other shady reason. It takes going to court, spending lots of money on attorneys, and fighting, often with extremely heavy hearts, to prove that person unable to sanely care for themselves, and then to lock them away in an institution. A snap-of-a-finger? Again, I think not. Truly, mass shootings, or shootings at all, are a frustrating and senseless, complex problem to solve. What we need are real and effective solutions toward solving these heartbreaking crimes—other than gun control or strengthening background checks. In the case of the Texas shooter, he was stopped from killing even more churchgoers by a private citizen with his own legally-owned gun. Something to seriously consider. President Trump as the biblical Nathanael? As a final Parkinson’s update, I was able to bump up my second-opinion appt from late March to yesterday. I have “Parkinsonism,” which is the effects of Parkinson’s Disease brought on by the regular use of Abilify. Because I have Rem Sleep Behavior Disorder (acting out my dreams while asleep), I have a 50-80% chance of developing Parkinson’s Disease in the future. This is good and bad news. As a result, I will stop using Abilify and see if the Parkinsonism goes away or not. Basically, I don’t have Parkinson’s right now, which is very good news, even though the possibility of it developing later in life is pretty high.